To all our followers. I urge you to take the time to watch this video. It explains the roots of the Black Lives Matter Movement (BLM) which follows a doctrine called Black Liberation Theology. In the beginning of the video, I briefly touch on the hypocrisy of those that support BLM and yet believe in Darwinian Evolution, but then afterward thoroughly expose the history of this movement by dissecting an interview of what is deemed the founder of Black Liberation Theology – James Cone. The “religion of peace” strikes again! 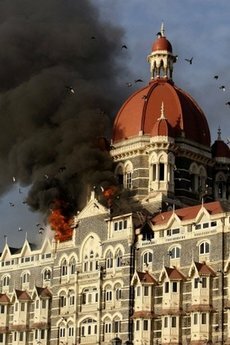 While America celebrated Thanksgiving, India was reeling from a coordinated attack which targeted Americans and Britons. While we in the States were making plans, preparing meals, and spending time with family, it seems that the “religion of peace” was conducting a “ministry outreach” in India. I don’t want to sound like an alarmist, and this is certainly not a “thus saith the Lord,” but America better brace itself because this relentless Hall-spawned advancement of Islam is going to visit our shores real soon . . . again. Sadly the masses have fallen back to sleep since 9/11 partly because President George W. Bush (whether you like him or not) has taken the fight to the terrorists–keeping the Islamic Jihadists busy in Iraq and Afghanistan and keeping them out of our cities and our neighborhoods. But with a newly elected president who’s tougher on the Second Amendment and the unborn than on terrorism, I hope that at least some of us will be prepared for what’s about to befall our nation. Those who want to see this nation (and Israel) eliminated will most certainly take another swipe at us once our new president takes office. Especially when you consider that Barrack Hussein Obama sat under the intolerant, anti-American, hate-filled, socialist, black liberation rhetoric of Jeremiah Wright for twenty years. It’s difficult to listen to that vitriolic ranting for two decades (against the very country you live in) and not be influenced. Most terrorist experts agree that America will be attacked again, and it’s not an if but a when. Anyone who’s paying attention to what’s going on (and not too preoccupied with Fantasy Football or American Idol) can see the handwriting on the wall. So my question is this: What do you think the next attack on America will be by the “religion of peace“? Barack Obama’s church making waves yet again. Presidential candidate Barack Obama’s Chicago area United Church of Christ is back in the news. This time it’s not because of remarks by Jeremiah Wright but instead it’s for the remarks of Catholic Priest Michael Pfleger (invited to speak at Trinity) during a Christless, racist-laden sermon tirade. This is supposed to be Christianity?